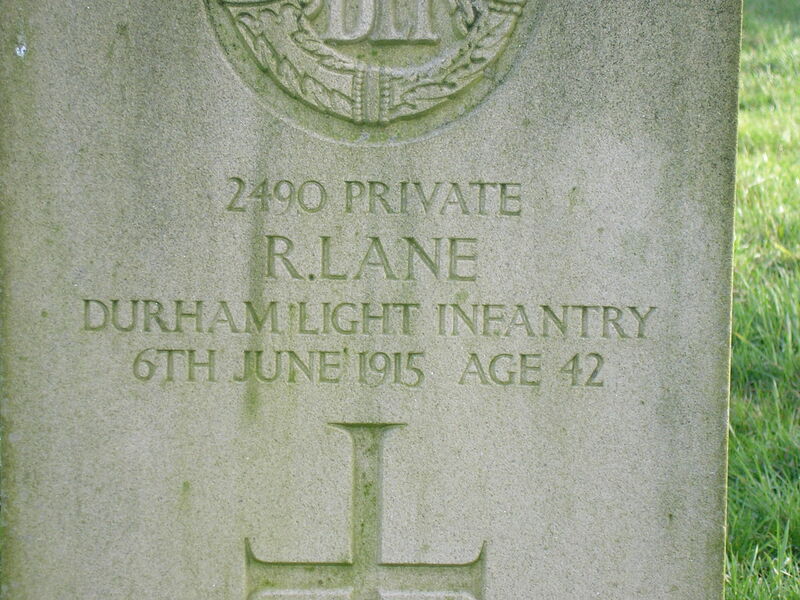 2490 Private Robert Lane, 6th Battalion, Durham Light Infantry died of wounds 6 June 1915 and is buried in West Auckland Cemetery and commemorated on the St. Helens Colliery Memorial Cottages, County Durham. He was 42 years old, husband of Sarah Annie Lane and father of 3 children. In 1911, they lived at 6 Gladstone Terrace, West Auckland. Robert worked as a coal miner (hewer). Later, Mrs. Lane lived at 18 Whitwell Terrace, St. Helen’s Auckland, known locally as “the Square”. Previously, Robert Lane served with the 1st Battalion, South Lancashire Regiment in the South African Campaign (Boer War) and given the regimental number 2771 and was awarded the South Africa Medal and the following clasps Orange Free State, Transvaal, Tugela Heights, Relief of Ladysmith and Laing’s Nek. Private Lane was a territorial with the 6/DLI and was given the regimental number 2490. He entered France 20 April 1915 with the battalion. the Battle of Bellewaarde 24-25 May. 24 April: Vlamertinghe, waiting for orders, French and Canadian wounded and gassed passed through, refugees streamed westwards. 6pm: marched through Ypres where buildings burned, the Cloth Hall still recognisable but damaged, past the Menin Gate, onto Zonnebeke and the ruined village of Potijze then at midnight relieved the 2/Shropshire Light Infantry. 25 April: 9pm left the trenches and marched to Zonnebeke, stopped at Verlorenhoek and lay in hedgerows. 6pm: the battalion was ordered to move in support of the 7/DLI and a battalion of the Shropshire Light Infantry and attack a hill held by the enemy. The advance was made through the usual heavy bombardment. B Company was ordered to fill a gap in the front line alongside 1/Hampshire Regiment. A & D Companies were to stand by in case they were needed to give further support. B Company remained in the line for 5 days until relieved, 30 April. They were constantly shelled during the day and needed to repair trenches at night. Food and sleep was limited. B Company’s casualties were 14 men killed, 1 officer and 55 men wounded. 2 May: 4.30pm the Germans commenced a violent bombardment of the front line and released gas. These were early days in the use of gas and the means of protection was limited and not particularly effective – cloth soaked in any liquid available, urine was used and held over the mouth and nose. There were no respirators at this time. Behind the bombardment came the German infantry but the attack was foiled and the front line was held. At 10.30pm the DLI was relieved. Casualties – 3 officers killed, 12 wounded, 2 sent home with shock, 27 NCOs and men killed, 218 wounded, 34 missing. There is a record that 1 man was wounded on the 26 May – this casualty may be Private Lane. Later analysis confirms that between 24 April and 4 May, 3 officers and 51 other ranks died. There were far fewer casualties from then up until the end of May, with a total rising to 4 officers and 64 ORs killed. Private Lane was awarded the 1914-15 Star, the British War and Victory medals. Private Lane is buried in West Auckland Cemetery, grave reference C.C. 648.